Sorry about this, guys, but I realized today that the mesh was borked. It must've happened when I made the fat morph. My poor Sims had deformed ribcages. So I've fixed the problem and uploaded the mesh again. 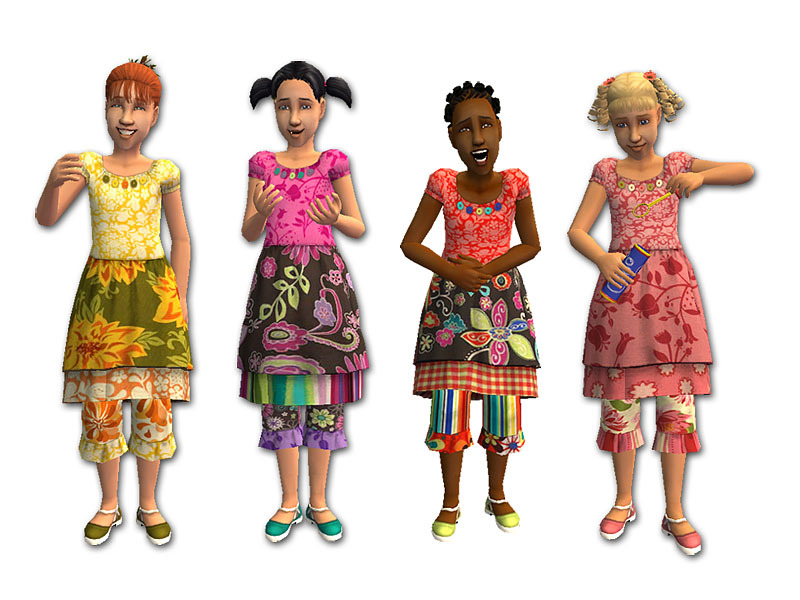 If you've already downloaded the big package of dresses, you can just replace the mesh. 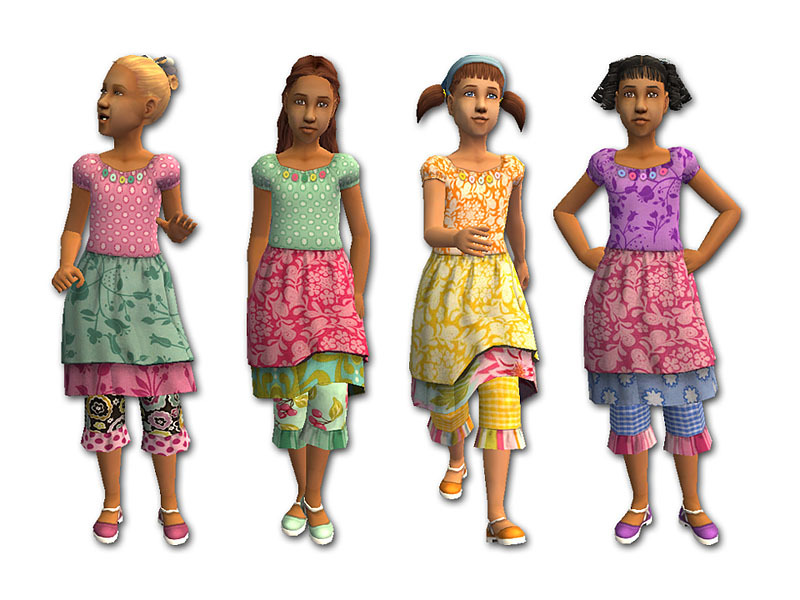 And if you haven't downloaded all the dresses yet, you can rest assured that I've put the fixed mesh in there. I'm really sorry about that! I don't know if you're familiar with some of the boutique clothing that's been coming out for children (real children) lately. Bright colours, bold mixes of patterned fabric, full skirts, and ruffles are some of the hallmarks of this style of clothing. I couldn't resist trying to make at least one such outfit for my little girl Sims. This is the result. I'm not sure if my Sims are laughing because they're happy, or if they're laughing because they can't believe I dressed them in such crazy dresses. I made eight different outfits. Each dress has a layered skirt and is worn over a pair of ruffled capri pants. A row of buttons decorates the neckline. All of the dresses also come with matching shoes. Because the skirt is so full, I noticed a few issues with the mesh. If your Sim is standing still, her hands will sink into the skirt. The skirt will also push through chairs and couches. They're small issues, though; otherwise, the outfit looks really cute when your Sim is running, jumping, catching butterflies, having water balloon fights, etc. I included a text file in the zip so you'll know which dress is which... although it may still be difficult to tell, due to all the colours! If in doubt, go by the colour of the shoes. The red hair with bangs and the long brown hair are age conversions by melodie9. The blue kerchief hair is an age conversion by fanseelamb. Thanks for the cute hairstyles!